The all-new Pride Electric Go-Chair is re-engineered from the ground up, offering a sleek, bold new style available in an array of contemporary colours. 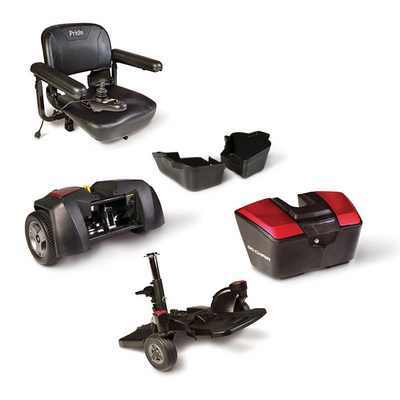 Enhanced performance and comfort, along with 5 piece disassembly, allows you to enjoy light-weight travel and independence on the go. With an increased weight capacity of 21 stone 6 lbs and a sleek, bold look, the new Go-Chair makes travel easy. The Go-Chair is simple, compact, easy to use, and easy on your wallet too. The joystick controller can be set on either side, and there are two motors for enhanced manoeuvrability and a small turning circle. The top speed is around 5.5km per hour or 3.5 miles an hour, and the range is around 10 miles on a full battery charge. It has solid, puncture-proof tyres and can be used inside or outdoors. Recharging is easy- you don't even have to take the battery out of the chair. 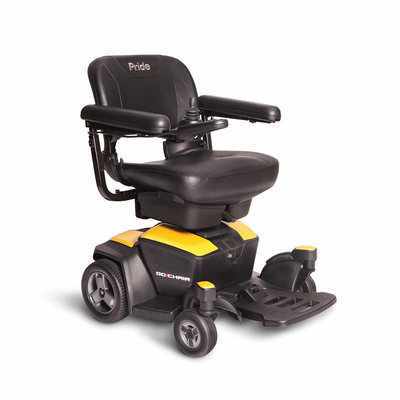 In all, we think this is a great option for those who need a little more mobility when out and about. 45cm x 42cm, 5-point swivel seat with latch release.